I led a wine tasting last week for students at Dartmouth’s Tuck School of Business. I like pouring for twenty-somethings because they’re so eager to taste and talk about wine. With B-schoolers like these, I’ll also cover the industry, from merchandising to pricing and distribution, but mostly I’m there to get wines into their bodies and get them thinking about the culture of wine, how to evaluate it, and how to integrate it into their lives. ‘09 Clüserath-Weiler Trittenheimer Riesling HC, 2009 Deutschherrenberg Schliescht Riesling, plus sundry other Rieslings produced by the Moseljünger, with salmon and kartoffel. In the Mosel, Germany. About half-way through the tasting, I poured a round of a Rhône-style red blend, primarily grenache with a little syrah and cinsault added for depth and top-notes. It’s a light-bodied, fruit-driven wine with great acidity, and so it’s really food friendly. I asked the assembled what they might pair it with. Poultry? someone ventured. Good, yes, roasted poultry would be great. What else? Cheese, someone said. Sure—and what else? Long pause. How about fish? I offered. This wine has supple tannins, so it would readily pair with lighter meats and seafood. Grenache in general is great with fish. A few heads nodded hesitantly as I sensed some of them trying to wrap their minds around red wine with fish. A fellow in the corner raised his hand. So, how do you figure out what goes with what? he asked. How do you learn about pairing? I don’t have an easy answer for you, I replied apologetically, but it is a great question. I have books on wine and food pairing, and while reading’s no substitute for tasting, books can introduce the foundation principles. You need to understand how to balance a wine’s sweetness, savoryness, acidity, fruitiness, tannin, and weight with those same elements in the food, while also accounting for the food’s spiciness, saltiness, or richness. I guess it also helps that I’ve been cooking for twenty-five years, I continued, so I know what food tastes like, and I can conjure those taste memories when I’m tasting a wine. I jot notes on all the wines I taste, and addition to noting Color, Aroma, Flavor, and Finish, I’ve recently added a fifth category: Pairing. Here, while the wine’s fresh on my palate, I think about what I might pour it with—regardless of what I’m about to serve for dinner. I guess my best answer, I concluded, is to buy a couple of books, then to become attentive, noticing what works best for you. The young man nodded and smiled, perhaps appreciatively, or perhaps simply relieved that I’d run out of air. Wines with moderate acidity are generally quite food-friendly. This is because they can cut the richness of a rich dish, and can also balance the flavor of acidic ones, like salad dressing or fresh tomato sauce. Also, acidity in a food can emphasize fruit flavors in the wine. A wine with a little residual sugar is also very food friendly, especially with salty and savory foods, rich foods, and—not surprisingly, because they’re often salty, savory, and rich—many cheeses. If a wine has both acidity and residual sugar, it is likely incredibly companionable. Riesling, demi-sec Champagne, Gewürztraminer, and off-dry rosé pair well with a vast array of meats, seafood, poultry, cheeses, vegetables, and fruits. Dessert wines should always be at least as sweet as, if not sweeter than, the dessert itself, otherwise the wine will seem flabby. Sweet dessert wines with a little acidity, for example a Muscat de Beaumes de Venise or Recioto di Soave, can provide palate relief for sweeter desserts, like crème brulée or tarte tatin. 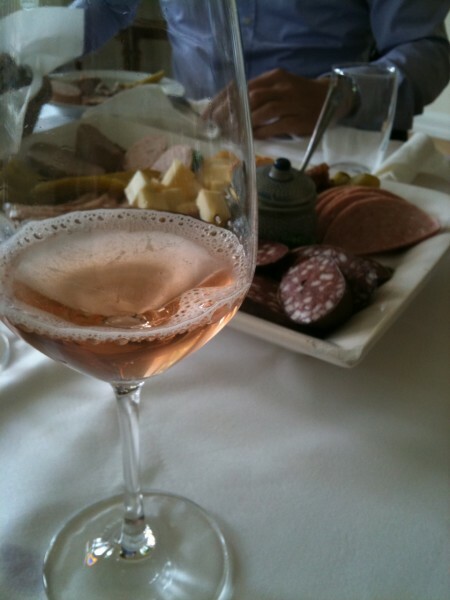 Rosé Secco Trocken (Spätburgunder), a sparkling rosé with charcuterie, including the best liverwurst I will ever eat, in the Pfalz. 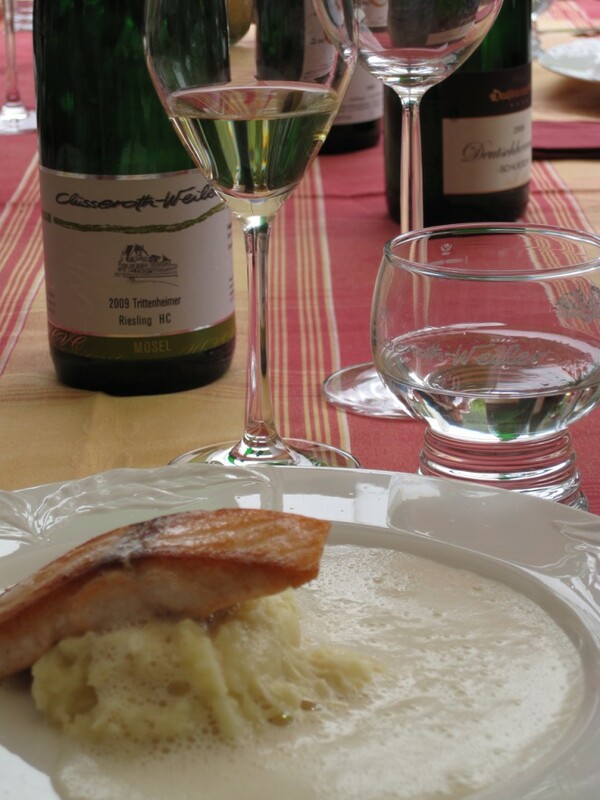 Very light-bodied wines, like Muscadet, Pinot Grigio, or Asti, can be overwhelmed by very flavorful foods, but partner well with lighter fish, poultry, and poached or steamed dishes. Chardonnay is an incredibly versatile grape, but the unoaked wine style is much more versatile than the oaked style. Pair unoaked, minerally Chard with leaner meats, fish, seafood, and younger cheeses; pair oaky, buttery Chard with richer butter- or cream-based sauces, richer seafood (like lobster), and roasted poultry. Bubbles are cleansing. This is why Champagne goes so well with rich dishes, including fried foods. The texture and, frequently, the acidity of sparkling wines scrub your palate, refreshing it for the next bite. Light-bodied reds are great cross-over wines, suitable for meat, poultry, fish, and vegetables. Pinot Noir, gamay-, or grenache-based wines, and some Loire reds fall into this category. Pinot Noir is often cited as one of the most versatile reds, good with red meat but also excellent with roasted turkey and salmon. Medium bodied, fruit-driven white and red wines, e.g., Beaujolais, Merlot, Pinot Blanc, Viognier, and New World Pinot Noir, are also reasonably versatile, taking one through the cocktail hour—when they might be drunk by the glass with very little food—to the table, where they’ll pair with a range of fare, especially American cuisine. Low-tannin red wines can be good with a little chill on them in the summer. Grenache (either varietal Grenache or a red from Châteauneuf du Pape), gamay-based wines, and Lambrusco generally have enough fruit not to shut down when they’re a bit cold. Tannic red wines are best partnered with a little protein and fat. This is why wines from Bordeaux, Cahors, and Rioja are so often served with roasted—and especially rare—red meats. High-alcohol wines, including California Zinfandel, Australian Shiraz, Southern Italian reds, and many New World wines need to be paired with rich and highly savory food, like barbecued or roasted meats, and richer, aged cheeses. Ditto full-bodied wines, those with both high alcohol and heavy weight. High tannin and alcohol levels in a wine make spicy food seem spicier. Reach instead for a wine with moderate alcohol and a little residual sugar that will tame the heat on your tongue. I recently poured an off-dry gamay-based Vin de Table with steak tacos and it was magnificent. Wines with prominent herbal or vegetal notes, like Sauvignon Blanc (grassy), Côtes du Rhône (Provençal “garrigue” herbs and anise), or Cabernet Franc (green pepper) pair well with vegetable and vegetarian cuisine, including stews, gratins, and sautées, and with roasted herb-rubbed meats. Wine and cheese pairing is harder than you might think. I’ve found that some wines go well only with cow’s milk cheeses, some are great with goat. Generally, fresher cheeses need leaner wines, and aged cheeses, which generally have substantial umami flavors, need more robust wines. Goat cheese is particularly high in acidity, so needs an acidic wine. The safest pairing for a varied cheese course is a wine with a little sweetness, like Gewürztraminer, off-dry Sherry, or Moscato d’Asti. Riesling goes with everything. Well, not everything—not a bloody steak, to my palate. But this wine’s range of sweetnesses plus good acidity make it one of the most versatile wines on the planet. Which of these pairings ring true for you? What’s your favorite pairing, or your favorite pairing rule? Meg Houston Maker, MA, CSW, is a writer curious about nature, culture, food, wine, and place. Find her essays about the pleasures of the table at Maker’s Table, and follow her on Twitter @megmaker. All great things to consider with food and wine pairing. But I must say, the way you feel about Riesling is the way I feel about sparkling. It goes with (almost) everything. Even grilled lamb as I found out earlier this week. Thanks, Mary, for weighing in. Sparkling wines, are incredibly versatile because they’re made in such a wide range of styles. They can feel or lean, or fat, or cleansing, or fruity, or hugely savory—or a mix of these qualities. With grilled lamb I’d probably choose blanc de noirs, especially one with some heft, or a sparkling rosé. But pairing is about what makes your palate feel happy, and what works best for you works, period. What sparkler did you choose with your lamb? We drank the Pierre Gimonnet & Fils Brut Champagne. I normally would have gone rosé or blanc de noirs, but it’s what we had at the time, and though it was 100% Chardonnay, it still had great acidity and went absolutely fine with the lamb. Plus, I can hardly be critical when I’m drinking Champagne. It makes me too happy! When the occasion arises that someone needs my assistance in a wine pairing, I always ask about the whole dinner. What veg? Appetizer? Salad and dressing? etc. How many people? How many wines? If someone is having roasted chicken with potatos I would recommend a different wine than if they were serving roasted chicken with steamed broccoli. Excellent point. It’s not just about the protein, and it’s critical to look at the other flavors on the plate, including the sauce and accompanying vegetables and starch. If I’m serving a meal with three or four courses, I usually target a wine for each course, mostly because it’s easier to plan. But I do remain mindful of transitions in case diners want to continue enjoying a wine into the following course, or open the next wine early. I was pleasantly surprised recently when a Viognier-Roussanne blend, originally designed to pair with a fruit-sauced roasted pork loin, was opened during the salad course and proved a felicitous match. The salad had some bacon and blue cheese, which is an old trick to make salad more wine-friendly, but was nonetheless dressed with a somewhat acidic dressing, and we hadn’t planned a wine to accompany it. But the acidity, body, and tannin of the white blend were a flawless match. I’ve had Riesling-prone friends pour it with every course of complicated meals where the dishes had a lot of different flavor profiles, and it did seem to work. My personal “goes with everything choice” would be Viognier, largely because it seems to work with “heavy” white-meat dishes like some of the more strongly flavored turkey or rabbit recipes — but it’s a lot more difficult to find at restaurants than Riesling. The regional wine I wish I could find more readily is New Mexico whites — these are fruity whites that go incredibly well with the local highly-spiced cuisine but are seemingly impossible to find in nearby Arizona. Thanks for sharing your favorite go-to choice. I agree that Viognier qua Viognier can be a little hard to find on wine lists (and Condrieu—forget it!). If you don’t see Viognier and don’t feel like Riesling, you might look for white or yellow Muscat, which has a floral quality that can present as sweetness even if the wine is fully dry; a varietal Roussanne, which is full-bodied like Viognier; or a white California Rhône-style blend, which might even have some Viognier in it. I love bubbles and fried food. Heaven. Definitely. Bubbles are also great with buttery, crispy foods like phyllo pastry, cheese straws, and mini tartlets. For Riesling also substitute Sauternes! I know everyone labels it as a dessert wine but you won’t catch the Sauternais making that mistake as they regularly drink it with oysters, roast meats, spicy dishes and so on. It’s the same rule about having both residual sugar and acidity but in the case of Sauternes you can also get some incredibly concentrated and complex flavours as well. Bliss! Funny you should mention this, because I was just reading today about the versatility of Sauternes. Regrettably, I’ve not had enough of it to know. Must rectify soonest! Very good article! Definitely agree with your point about wine and cheese pairing – it is considered “typical pairing” by many, but it is actually one of the hardest pairings to achieve next level of experience – quite often subtle flavors of both wine and cheese all of a sudden refuse to play together, in a rather a dramatic way. One pairing which I usually enjoy is wine and chocolate – yes, one can call is as abused as “wine and cheese”, but actually dark chocolate goes very well with classic Cabernet wines, especially those which have some green notes and not overly sweet. Milk chocolate can actually go quite well with some of the white wines, including Riesling and dessert wines. For New Year’s Eve, our friends made oyster soup… and served Sauternes with it! They made a wonderful point: So often we arrive at dessert a bit tired, palate-fatigued. The wine might be an afterthought. Why push a potentially great wine like Sauternes aside? It made a dazzling partner for the soup, a gorgeous start to a long, relaxing meal.